Hawaii’s Kilauea volcano continues to erupt, spreading a layer of lava that has added about 700 acres of fresh land to the Big Island. Kilauea has been erupting continuously since May 3, spraying lava through several vents along the flanks of the main cone. These lava flows have destroyed more than 700 homes and one charter school, so far, according to Hawaii News Now. Hundreds more homes are either damaged or inaccessible because of the 6-mile chain of lava vents along the slope of the cone. About 1,500 people have been evacuated. The largest and most active fissure is identified by USGS as Fissure 8. 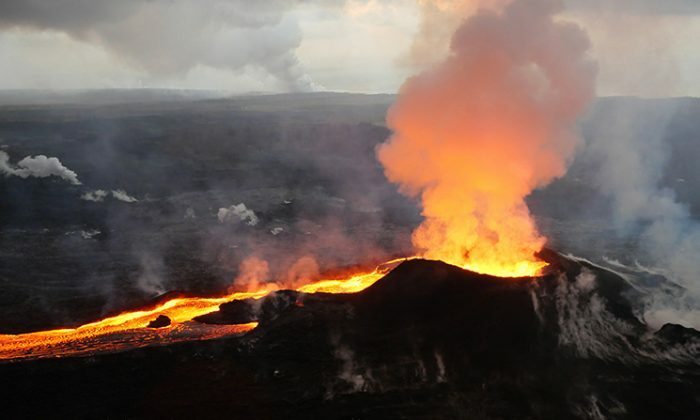 It has formed a cone of cooled lava and cinders 180 feet tall—a new mini–volcano on the slopes of Kilauea, which is itself a volcanic protrusion on the side of Mauna Loa. Lava had covered more than 6,100 acres of the island, the USGS reports, and continues to flow out of Fissure 8 at a rate of approximately 100 cubic meters per second. The ongoing lave flows have created 700 acres of new land in Kapoho Bay, CBS reported. Hawaii News Now reports that a new island has formed as well. The latest explosion, on July 16, injured 23 passengers on a tour boat sightseeing too near the lava flow. Meanwhile, the actual cone of the volcano is shrinking. As magma—molten rock—flows out of the several vents on the volcano’s flank, the pocket under the peak shrinks. USGS scientists captured this aerial photo of Halema‘uma‘u and part of the Kilauea caldera floor during a helicopter overflight of Kīlauea’s summit on July 14, 2018. (USGS). According to USGS, the floor of Halema‘uma‘u Crater has dropped about 1,480 feet since the eruptions started on May 3. The cone also explodes regularly. Civil Defense officials say the last explosion, at 11:45 a.m. on July 16, released the amount of energy of a 6.5-magnitude earthquake, Hawaii News Now reported.